In the beginning, my art flowers were single-dimension. 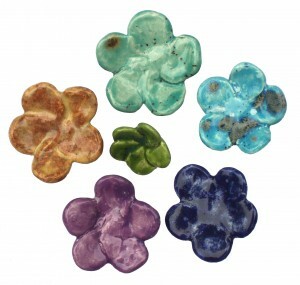 Then, I gave my ceramic and glass flowers wedded bliss after years of single life. I called these new flowers “nested” and used them in sculptures. These little nests begat another evolution: The nested flowers ‘look’ lent itself to use in a necklace (so said my friends / customers), and my house of sculpture added a small room for jewelry. 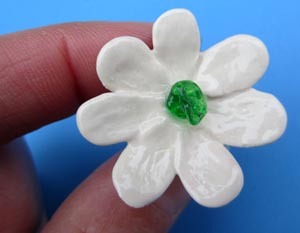 Generations of flowers passed, and this fall the latest evolution presented itself: Daisy-style ceramic flowers with a weeny glass center. With the daisy fervor still rampaging, another evolutionary tributary has begun to flow: Patterns, evoking decorative traditions from Poland (my heritage), Hungary, Romania, Czechoslovakia and others.